Senior technology executives need to be aware of the pitfalls and best practices when dealing with recruitment agents and headhunters to find the best opportunity. As the number of UK IT professionals looking for a new career challenge rises, senior technology executives need to be aware of the pitfalls and best practices when dealing with recruitment agents and headhunters to find the best opportunity. Recruitment firm Monster.co.uk recently polled 228 UK technology staff and found that 92% were considering changing jobs. At the senior end of the career spectrum, the latest Harvey Nash and PA Consulting CIO survey found that 170 out of 723 senior IT managers polled were actively looking for a new role, while 342 would entertain a call from a headhunter. CIOs seem to agree that online IT resources do not cater well for senior roles, so the majority of placements will typically happen via personal networks, or headhunters and agencies specialised in executive appointments. As well as hesitation about the frail state of UK economy and all the natural apprehension around job hunting, professionals at the top of the IT pyramid have to deal with certain particularities when seeking help to find a new role, which can be challenging at times. Many people operating at a senior level in IT will often leverage their contact network and offer independent consultancy services after leaving a full-time position. If the idea is to look for a new permanent role while working for a client as a adviser, balancing diary priorities may be tricky, according to Denise Plumpton, who stepped down from her CIO job at the Highways Agency last year and is now a consultant focused on strategy, customer service and organisational efficiency. "The key is to be visible and available," she says. "It's a more difficult balance of the diary when you are working as a consultant, compared with being in a permanent role, as you are constantly aiming to be flexible with the organisation where you are consulting and there can be an expectation by the customer that you are all theirs." Another senior IT executive, who left a major UK retailer last year and is currently job hunting, agreed with Plumpton and said that good diary management is critical when searching for a new role. "If you are out of work, your time becomes even more valuable, unless you have resources available to take it easy when you are looking for a new position," says the IT chief, who requested anonymity. "So before agreeing to meet a headhunter, or a prospective employer for an interview, make sure they know what they are talking about and that job matches your skillset - don't just go for anything that comes up, as it may well be a waste of everyone's time," he says. Finding the right employer and the right job is not a unilateral responsibility - employers must properly articulate the role and the skills and experience they are seeking, while candidates must be able to convey their skills and experience and concentrate on the elements that are important to the employer, rather than firing standard CIO CVs to recruitment agencies and headhunters. Executive search agents must also fully understand the brief and also have some grasp of the employer's business and culture. Another crucial part of their role is to provide the right level of advice and that is an area where many CIOs seem to have been let down. "The process constantly falls down at the feedback stage. The candidate applies in good faith and is promised a reply, which all too often never happens and this is especially annoying when the candidate has met or at least spoken to the recruiter and then seems to disappear from their radar," says Plumpton. "We all find it tough to give negative news, I understand that when you get hundreds of applications, it can be prohibitively time consuming to reply to all, but at least honour your promises and manage candidate expectations," she says. "Honest feedback is also invaluable; try to make it constructive criticism, but if it really is the case that, 'you'll never get a job wearing that old suit', then please do find a way to say it." Even though business-IT alignment and the need to spend more time in non-technology tasks is an old constant in the CIO community, another common complaint from senior IT managers looking for a job is that headhunters will often focus on specific technology skills. The tendency to "pigeonhole" IT managers is something John Bovill, outgoing CIO at Aurora Fashions, has also found when interacting with recruitment professionals. "It is very important to be clear on search criteria and only compromise on the non-essential elements. Ensuring that both parties are incentivised on ensuring the correct job and company fit as a foundation for a long-term, sustainable relationship," he says. 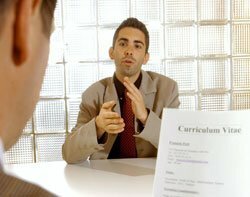 Bovill says he has been in the situation of not getting an interview for a job due to the recruiter's inability to present his profile to a prospective employer, but says this was a valuable experience. "My lesson learned was to adjust my CV to ensure it is a reflection of my style and approach, and not just the job content and achievements," he says. Kevin Power, former chief technology officer at United Utilities was looking for a permanent role last year before being hired as a principal consultant by Xantus Consulting. He found that the modus operandi of headhunters seemed too exclusive at times. "I found it best to request a copy of the role definition and then qualify myself as interested and appropriate, or not. Some headhunters just appear to be following a trail of recommendations to find anyone who may be interested in the vacancy," Power says. Based on his experience as a manager hiring staff and as a jobseeker, Power points out that many headhunters have "unrealistic" expectations. "They should consider providing incentives for recommending good candidates from personal networks," he says. Sam Gordon, associate director at CIO headhunter La Fosse Associates, says that one of the most important aspects of his job in executive search is to meet IT chiefs on a speculative basis to get a feel for their backgrounds and aspirations, as well as management and technical skills. "A headhunter's network is one of their most valuable tools," says Gordon, who says his firm spends a "considerable" amount of time getting to know a client's culture and needs before contacting candidates that could match the role. "It is crucial to properly understand the client's brief. When undertaking an executive search, we insist on meeting all the relevant stakeholders: peer-level management, board members and anyone else who may influence that particular role," he says. "We may set some non-negotiable parameters when it comes to the candidate skills and experience but we will have situations where, for example, someone has not been a CIO before but has all the qualities needed for the job and is ready to step up. Part of our job is to also challenge clients to think about a role when appropriate." Internet-based recruitment tools such as LinkedIn have made it easier for companies to target candidates by themselves, but using a headhunter is still necessary for senior roles, says Robert Grimsey, group marketing director at Harvey Nash. "It is true there is a lot more that employers themselves can do to find the candidates they need than they could 10 years ago. But at the same time, the industry has become a lot more complex," says Grimsey. "While it is easier to get access to people, businesses often need an external party with experience in the area to understand the market and which people they should be approaching," he says. "In-house recruiters rarely engage in senior appointments. They come to us because they need a different service that adds value." Responding to criticisms about the commissions paid to headhunters, Grimsey says that rates are fair, because executive search is a specialised and time-consuming service. "The commissions reflect the importance of the role we play," he says. "If a company questions the value of a service like that, it is because the headhunter didn't deliver." Build your contact network: Sam Gordon at La Fosse says, "I could imagine the frustration of someone suddenly facing unemployment and having to build rapport from scratch with a headhunter, who may also happen to be very busy. It's crucial to maintain a network of contacts and be engaged with them, even when not looking for work - not just headhunters, but also industry peers at the companies they may want to work for - so when the need arises the warm relationships are there." Work on your personal brand: Robert Grimsey at Harvey Nash says, "IT executives need to think a lot about their personal brand. They have so much to talk about but tend to not want to make themselves well-known. Things they could do include writing a blog, speaking at conferences, contributing to the wider community - and I don't think IT people do that very well." Review your CV: "If CIOs are looking to present their skills and experience they should think carefully about how they do it. Despite having achieved a great deal, their CVs are often awful and way too technical, so a good idea when meeting a headhunter is to get at least five minutes of feedback about their CVs," says Grimsey. Spend time with them: Denise Plumpton says, "To get the best out of headhunters, it's vital to invest your time up front to help them to get under the skin of your company and get a feel for the sort of person who will fit in to the culture and values of the organisation. Simply emailing a job description isn't going to get you the best shortlist." Keep up-to-date: "Have regular update calls with the headhunter to get progress and feedback from initial interviews - be prepared to challenge the proposed shortlist if you feel that there's a candidate about to be lost whose CV has particular appeal to you - but discuss, don't dictate, otherwise why did you bother to go to the trouble and expense of using a headhunter in the first place," says Plumpton. Question their methods: "Ask for honest and open assessments, there may be a very good reason why the owner of that brilliant CV wouldn't fit - or it just may be that you specified a maximum number on the shortlist and there are enough other good candidates. Communication is key," she says. Be focused: Kevin Power says, "I found it best to concentrate on one or two good agencies that developed a good understanding of my team and its challenges, rather than a blanket 'scour the market' approach. This time spent upfront was recovered through not interviewing unsuitable candidates." • CIO headhunters and agencies specialised on executive search normally charge a commission of a third of the candidate's first year salary - top IT roles get pay packets of about £120,000 to £175,000, according to recruitment firm Robert Walters. • Recruiters operating at that level usually work on an average of seven to 20 assignments at any one time, depending on their internal resources. Agents expect exclusivity when working for very senior roles. • A shortlist with five to seven individuals is delivered to the client about two weeks from the start of the engagement. The employer will then choose to have interviews with two people. The recruitment process, from first contact to the job offer, lasts between four to six weeks. • While recruitment companies will not discuss their failure rates, most will repeat assignments for senior searches for free, or at a heavily discounted rate, if the candidate proves unsuitable for the role after a certain amount of time. • When working on global agreements, which involve recruitment of several roles - usually the case in so-called IT transformation programmes - headhunters and agencies will normally offer a reduced rate, whereas it is a lot harder to get a discount for one-off assignments.